Simon Grant is a visual neuroscientist specializing in binocular functions and their contributions to human action control. He joined City University London in 2000 having previously worked as a lecturer at Imperial College and Charing Cross & Westminster Medical Schools in London. Simon Grant has a BSc in Human Biology and a PhD obtained at the National Institute for Medical Research, London. This was for anatomical and physiological work on animal models of human amblyopia, squint and binocular (3D, depth, stereo) vision loss, an interest that he pursued in post-doctoral research at University College London and the Medical College of Pennsylvania (Philadelphia, USA) and in his subsequent lectureships in London Medical Schools. 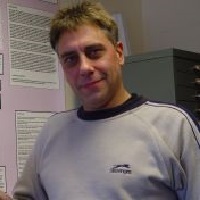 His research focus shifted on joining Optometry at City University, where his main area of work has been on the contributions of normal binocular 3D vision to the control of reaching and grasping movements, and on evaluating deficits in these eye-hand coordination skills in children and adults with amblyopia and/or selectively reduced binocular functions. Amblyopia is a common developmental disorder of spatial vision associated with well-documented perceptual deficits in acuity, contrast sensitivity and binocular 3D vision. Simon's principal research examines the consequences of these dysfunctions on the ability of affected children and adults to perform everyday real-world visually-guided tasks, with a specific focus on their eye-hand coordination skills. His recent work has characterized the disabilities in reaching and, particularly, precision grasping present in all age-groups of people with amblyopia, and has established that these deficits are more related to their loss of binocular stereo vision than to reduced visual acuity. A conclusion drawn is that the conventional focus of amblyopia therapy in improving monocular acuity needs to be shifted to rectifying the primary underlying problem in binocular vision. To these ends, he is currently exploring, with clinical colleagues, whether novel treatments, involving perceptual learning paradigms and video-game training, are more effective approaches for recovering the deficits in both binocular depth perception and hand action control in amblyopic subjects. Grant, S., Suttle, C., Melmoth, D.R., Conway, M.L. and Sloper, J.J. (2014). Age- and stereovision-dependent eye–hand coordination deficits in children with amblyopia and abnormal binocularity. Investigative Ophthalmology and Visual Science, 55(9), pp. 5687–5701. doi:10.1167/iovs.14-14745 . Melmoth, D.R. and Grant, S. (2006). Advantages of binocular vision for the control of reaching and grasping. Exp Brain Res, 171(3), pp. 371–388. doi:10.1007/s00221-005-0273-x . Hilgetag, C.C. and Grant, S. (2001). Uniformity and specificity of long-range corticocortical connections in the visual cortex of the cat. Grant, S. and Conway, M.L. (2019). Some binocular advantages for planning reach, but not grasp, components of prehension. Experimental Brain Research. doi:10.1007/s00221-019-05503-4 . Grant, S. (2015). Gaze–grasp coordination in obstacle avoidance: differences between binocular and monocular viewing. Experimental Brain Research, 233(12), pp. 3489–3505. doi:10.1007/s00221-015-4421-7 . Beul, S.F., Grant, S. and Hilgetag, C.C. (2015). A predictive model of the cat cortical connectome based on cytoarchitecture and distance. Brain Structure and Function, 220(6), pp. 3167–3184. doi:10.1007/s00429-014-0849-y . Grant, S. and Conway, M.L. (2015). Reach-to-precision grasp deficits in amblyopia: Effects of object contrast and low visibility. Vision Research, 114, pp. 100–110. doi:10.1016/j.visres.2014.11.009 . Melmoth, D., Grant, S., Solomon, J.A., Morgan, M.J. and Morgan, M.J. (2015). Rapid eye movements to a virtual target are biased by illusory context in the Poggendorff figure. Experimental Brain Research. doi:10.1007/s00221-015-4263-3 . Makris, S., Grant, S., Hadar, A.A. and Yarrow, K. (2013). Binocular vision enhances a rapidly evolving affordance priming effect: Behavioural and TMS evidence. Brain and Cognition, 83(3), pp. 279–287. doi:10.1016/j.bandc.2013.09.004 . Melmoth, D.R. and Grant, S. (2012). Getting a grip: Different actions and visual guidance of the thumb and finger in precision grasping. Experimental Brain Research, 222(3), pp. 265–276. doi:10.1007/s00221-012-3214-5 . Grant, S. and Moseley, M.J. (2011). Amblyopia and real-world visuomotor tasks. Strabismus, 19(3), pp. 119–128. doi:10.3109/09273972.2011.600423 . Suttle, C.M., Melmoth, D.R., Finlay, A.L., Sloper, J.J. and Grant, S. (2011). Eye-hand coordination skills in children with and without amblyopia. Investigative Ophthalmology and Visual Science, 52(3), pp. 1851–1864. doi:10.1167/iovs.10-6341 . Tibber, M., Saygin, A.P., Grant, S., Melmoth, D., Rees, G. and Morgan, M. (2010). The neural correlates of visuospatial perceptual and oculomotor extrapolation. PLoS ONE, 5(3). doi:10.1371/journal.pone.0009664 . Hilgetag, C.C. and Grant, S. (2010). Cytoarchitectural differences are a key determinant of laminar projection origins in the visual cortex. NEUROIMAGE, 51(3), pp. 1006–1017. doi:10.1016/j.neuroimage.2010.03.006 . Tibber, M., Saygin, A., Grant, S., Melmoth, D., Rees, G. and Morgan, M. (2010). The neural correlates of visuospatial oculomotor and perceptual extrapolation. PERCEPTION, 39(2), pp. 277–277. Grant, S. (2010). Cranial nerves supplying the extraocular muscles. Optometry Today, 50, pp. 18–18. Kotecha, A., O'Leary, N., Melmoth, D., Grant, S. and Crabb, D.P. (2009). The functional consequences of glaucoma for eye-hand coordination. Invest Ophthalmol Vis Sci, 50(1), pp. 203–213. doi:10.1167/iovs.08-2496 . Melmoth, D.R., Storoni, M., Todd, G., Finlay, A.L. and Grant, S. (2007). Dissociation between vergence and binocular disparity cues in the control of prehension. Exp Brain Res, 183(3), pp. 283–298. doi:10.1007/s00221-007-1041-x . Grant, S. and Hilgetag, C.C. (2005). Graded classes of cortical connections: quantitative analyses of laminar projections to motion areas of cat extrastriate cortex. Eur J Neurosci, 22(3), pp. 681–696. doi:10.1111/j.1460-9568.2005.04232.x . Melmoth, D.R. and Grant, S. (2005). Vision of the thumb as the guide to prehension. PERCEPTION, 34, pp. 243–243. Grant, S., Storoni, M. and Melmoth, D.R. (2005). Dissociation between the use of vergence and binocular disparity information in the control of reaching and grasping movements. PERCEPTION, 34, pp. 247–247. Finlay, A., Melmoth, D., Morgan, M. and Grant, S. (2005). Rapid learning enhances prehension performance in normal and stereodeficient subjects. SPATIAL VISION, 18(4), pp. 505–505. Grant, S. and Binns, K.E. (2003). Reduced influence of the ipsilateral ear on spatial tuning of auditory neurons in the albino superior colliculus: a knock-on effect of anomalies of the acoustic chiasm? EXPERIMENTAL BRAIN RESEARCH, 151(4), pp. 478–488. doi:10.1007/s00221-003-1495-4 . Grant, S., Waller, W., Bhalla, A. and Kennard, C. (2003). Normal chiasmatic routing of uncrossed projections from the ventrotemporal retina in albino Xenopus frogs. J Comp Neurol, 458(4), pp. 425–439. doi:10.1002/cne.10598 . Grant, S., Patel, N.N., Philp, A.R., Grey, C.N.B., Lucas, R.D., Foster, R.G. … Jeffery, G. (2001). Rod photopigment deficits in albinos are specific to mammals and arise during retinal development. VISUAL NEUROSCIENCE, 18(2), pp. 245–251. doi:10.1017/S095252380118209X . Hilgetag, C. and Grant, S. (2000). Uniformity, specificity and variability of corticocortical connectivity. Philosophical Transactions of the Royal Society of London. Series B: Biological Sciences, 355(1393), pp. 7–20. doi:10.1098/rstb.2000.0546 . Scannell, J.W., Grant, S., Payne, B.R. and Baddeley, R. (2000). On variability in the density of corticocortical and thalamocortical connections. Philosophical Transactions of the Royal Society of London. Series B: Biological Sciences, 355(1393), pp. 21–35. doi:10.1098/rstb.2000.0547 . Udin, S.B. and Grant, S. (1999). Plasticity in the tectum of Xenopus laevis: binocular maps. Progress in Neurobiology, 59(2), pp. 81–106. doi:10.1016/s0301-0082(98)00096-3 . Brickley, S., Dawes, E.A., Keating, M.J. and Grant, S. (1998). Synchronizing retinal activity in both eyes disrupts binocular map development in the optic tectum. Journal of Neuroscience, 18(4), pp. 1491–1504. Grant, S. and Berman, N.E.J. (1995). Late loss of connections during callosal development in Siamese cats. Developmental Brain Research, 88, pp. 132–147. Grant, S., Brickley, S.G. and Keating, M.J. (1994). Experience-dependent mechanisms of binocular map plasticity in Xenopus: incongruent connections are masked by retinal input. Neuroscience Letters, 182, pp. 13–16. Jeffery, G., Whitmore, A. and Grant, S. (1992). The mosaic of alpha cells in the cat retina is not dependent on axon terminal interactions during development. The Journal of Comparative Neurology, 317(3), pp. 298–308. doi:10.1002/cne.903170307 . Grant, S., Binns, K.E., Withington, D.J. and Keating, M.J. (1992). A topographic representation of auditory space in the external nucleus of the inferior colliculus of the guinea-pig. Brain Research, 589, pp. 231–242. Grant, S. and Berman, N.E.J. (1992). Topographic organization, number, and laminar distribution of callosal cells connecting visual cortical areas 17 and 18 of normally pigmented and Siamaese cats. Visual Neuroscience, 9, pp. 1–19. Grant, S., Keating, M.J. and Dawes, E.A. (1992). Plasticity of binocular visual connections in the frog, Xenopus laevis: reversibility of effects of early visual deprivation. Experimental Brain Research, 90, pp. 121–128. Grant, S., Dawes, E.A. and Keating, M.J. (1992). The Critical Period for Experience-dependent Plasticity in a System of Binocular Visual Connections in Xenopus laevis: Its Extension by Dark-rearing. European Journal of Neuroscience, 4(1), pp. 37–45. doi:10.1111/j.1460-9568.1992.tb00107.x . Keating, M.J. and Grant, S. (1992). The Critical Period for Experience-dependent Plasticity in a System of Binocular Visual Connections in Xenopus laevis: Its Temporal Profile and Relation to Normal Developmental Requirements. European Journal of Neuroscience, 4(1), pp. 27–36. doi:10.1111/j.1460-9568.1992.tb00106.x . Grant, S. and Keating, M.J. (1992). Changing patterns of binocular visual connections in the intertectal system during development of the frog, Xenopus laevis: III Modifications following early eye rotation. Experimental Brain Research, 89, pp. 383–396. Grant, S. and Berman, N.E.J. (1991). Mechanism of anomalous retinal correspondence: Maintenance of binocularity with alteration of receptive-field position in the lateral suprasylvian (LS) visual area of strabismic cats. Visual Neuroscience, 7(03), pp. 259–281. doi:10.1017/s0952523800004077 . Shipp, S. and Grant, S. (1991). Organization of reciprocal connections between area 17 and the lateral suprasylvian area of cat visual cortex. Visual Neuroscience, 6(04), pp. 339–355. doi:10.1017/s095252380000657x . Grant, S. and Shipp, S. (1991). Visuotopic organization of the lateral suprasylvian area and of an adjacent area of the ectosylvian gyrus of cat cortex: A physioligical and connectional study. Visual Neuroscience, 6(04), pp. 315–338. doi:10.1017/s0952523800006568 . Grant, S. and Keating, M.J. (1989). Changing patterns of binocular visual connections in the intertectal system during development of the frog, Xenopus laevis. Experimental Brain Research, 75(1), pp. 117–132. doi:10.1007/bf00248535 . Grant, S. and Keating, M.J. (1989). Changing patterns of binocular visual connections in the intertectal system during development of the frog, Xenopus laevis: I Normal maturational changes in response to changing binocular geometry. Experimental Brain Research, 75, pp. 99–116. Grant, S. and Keating, M.J. (1986). Normal maturation involves systematic changes in binocular visual connections in Xenopus laevis. Nature, 322, pp. 258–261. Grant, S., Keating, M.J., Dawes, E.A. and Nanchahal, K. (1986). Visual deprivation and the maturation of the retinotectal projection in Xenopus laevis. Journal of Embryology and Experimental Morphology, 91, pp. 101–115. Grant, S. and Keating, M.J. (1986). Ocular migration and the metamorphic and postmetamorphic maturation of the retinotectal system in Xenopus laevis: an autoradiographic and morphometric study. Journal of Embryology and Experimental Morphology, 92, pp. 43–69. Grant, S., Udin, S.B., Keating, M.J., Dawes, E.A. and Deakin, J.F.W. (1985). Intertectal neuronal plasticity in Xenopus laevis: persistence despite catecholamine depletion. Developmental Brain Research, 19, pp. 81–88. XIX Biennial Meeting of the International Society for Eye Research. Montreal, Canada (2010). International Amblyopia Symposium. London, UK (2010). Katie: The Science of Seeing Again. Channel 4 TV documentary about Katie Piper, a young woman partially blinded in one eye in an acid attack. She was about to have corneal stem cell and transplant surgery. I appeared on the programme to explain to her the general structure and function of the eye and to discuss the importance of the cornea for normal vision.